The Eloro District, under the administration of the Eloro GAL’s LDP, includes five villages in the south of Syracuse: Avola, Noto, Rosolini, Pachino e Portopalo di Capo Passer, situated in the far southern tip of the Sicilian eastern coastline. The total area stretches for 766,87 kilometres and makes up 46% of the entire provincial territory, while the total population of the district accounts for 43% of the entire province. It is widely known that the Eloro District is characterized by a rich cultural and environmental heritage, with important archaeological and naturalistic sites which give it a strong tourist attraction power and a remarkable potential for developing in that sector. 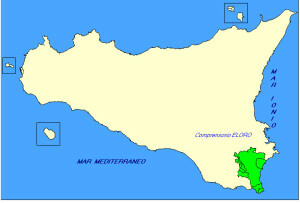 Endogenous resources, which will be shown in this section, are represented by both the areas of environmental importance – like the nature reserves of Vendicari and Cava Grande del Cassibile or the protected areas like Isola delle Correnti – and the rich architectural, historical and archaeological heritage that characterizes the territory: the Baroque, that has made Noto world capital of Baroque and is also visible in Avola; Eloro excavations; necropolises, spread all over the territory; and many others. Considering the abundant resources in this part of the Sicilian land, the number of tourists in the territory is definitely lower than its actual attraction potential. However, it is possible to notice a renewed interest for environmental sites with consequent attempt to introduce actions of exploitation into the territory development strategies. The above-named sites’ power of attraction is extremely remarkable; for instance, the site of Cava Grande del Cassibile reaches as far as 35.000 visitors a year from more than 90 Italian provinces and 15 countries, as it emerges from the monitoring activities carried out by “Azienda Regionale Foreste Demaniali”, the managing Body in charge of the administration of the state-owned forests (CESIS – Executive Committee for Information and Security Services – data, 2004 “Study on the exploitation of Cava Grande del Cassibile”). The territory is quite wide and there you can meet a lot of different landscapes and environments as you run across it, ranging from the marine environment along the coastline which, in spite of being sometimes degraded and improperly exploited, is considered a big tourist attraction; to wide inland areas where part of the territory is still intact; to the urban environments, with their varied dimensions and historical and architectural important features; to rural inland areas where you can see wide uplands dotted with old farmhouses. There are two important rural villages: San Paolo, today almost uninhabited; and Testa dell’Acqua, well equipped with public services, such as a drugstore, an elementary school and a first-aid post, and which hosts a lot of summer holiday-makers mostly coming from Noto. There are also numerous hamlets all over the territory, each with its own importance from the naturalist, historical and archaeological points of view. Characteristic elements of the inland landscape are the numerous Paleolithic Caves (Grotta di Calafarina) and the Pits, deep cracks in calcareous highlands of extraordinary natural value, not to mention the number of archaeological sites (Cava Grande del Cassibile, Cava Paradiso) typical of the rock architecture belonging to Prehistory to Byzantine Ages. In addition, the territory offers not only archaeological, artistic and anthropological heritage, but also food and wine tradition of international remark which needs protecting and saving in a sustainable way. Infrastructures appear to be limited and insufficient. In particular, though the opening ceremony of the road stretch connecting Cassibile to Rosolini, in April 2008, and the completion of Syracuse-Catania motorway have brought to a considerable cutback of travelling time and favoured a more efficient connection of the territory to the principal Sicilian towns, the general system of secondary roads together with the railway system are still very weak. Similarly, public transport system is really poor as it doesn’t allow adequate connection between the district villages as well as between the latter and the other sites of major tourist and cultural interest. With regard to the existing harbours, though they don’t resemble a typical trading port as they are mainly used by local fishermen and yachtsmen, they own remarkable tourist value. The population residing in the ELORO district total 102,183 inhabitants (January 1st, 2013 – ISTAT, Italy’s National Statistics Office); compared to 2001 and 2007, data show a slight growth. By analyzing the rise by age group, it emerges that the number of people aged 15 and over has considerably increased while the number of people aged 0-4 has decreased with a consequent increase of the aging index up to 110% in 2012. The population is distributed across 5 urban areas. Of these, only the city of Avola has slightly more than 30,000 inhabitants. Noto, Pachino and Rosolini have a population of little more than 20,000 inhabitants, while Portopalo di Capo Passero, with its 3,559 inhabitants, is the smallest village in the District. According to ISTAT data, the population density equals 132,34 residents. The lower density is recorded in Noto, where there are as few as 43 resident people per square kilometre, while the other villages have a rather high density. This situation depends on Noto’s huge territorial extension which accounts for 2/3 of the whole District. The production system of the area mainly lies on the business activity of micro and small enterprises which suffer the impact of big companies in particular in the informatics, real estate, renting and research sectors. As far as agriculture is concerned, people involved in this sector have to cope with common serious problems such as the difference between the price paid to the producer and the price paid to the end consumer; the hard relationship with the protagonists of the Large-scale Distribution they are trying to fight through the setting up of the “Val di Noto’s quality fruit and vegetable District” represented by Eloro GAL, which admits 102 enterprises and is officially recognized by Sicily Region; the poor integration of the agricultural sector into the tourist sector; the lack of processing initiatives; and innovation limited to few sectors. Most firms, about 80% of the total, are less than 5 hectares large, while less than 100 are at least 50 hectares. This is the symbolic datum of the collapse of the firms which results in their difficulty to realize production chains in various sectors. Moreover, all enterprises with more than 100 hectares are located in Noto whose territory is considerably wide and where several possessions derives from legacies of land-owning origin. The most remarkable phenomenon is related to the production of greenhouse and open field vegetables, mainly grown in the southern part of the District, around Pachino. In particular, greenhouse crops grown in protected structures (greenhouses or tunnels) now make up a real farming district of regional importance and has deserved considerable space in national press for its characteristics and ability to export products. LEADER II and LEADER PLUS programmes have invested in this sector by implementing marketing initiatives of producers’ trades and training operators who specialize in managing computerized greenhouses, now become a common practice. They have also invested in order to let the district obtain the right qualifications requested by community markets. The most important products are the carciofo violetto (violet artichoke), different types of potatoes, courgettes, peppers, watermelons and cantaloupes. The most famous product is the excellent ciliegino tomato, which has received the PGI (Protected Geographical Indication) status. The wine sector is deeply changing. After explanting hundreds of hectares of vineyards, particularly in the south, they have started greenhouse cultivation, by far more profitable. Some intelligent farmers have taken advantage of regional funds to plant quality vines. The citrus sector is characterized by one of the most diffused cultivations along the coast and the flood plains, by the rivers Tellaro and Asinaro, and along the stream Gioi. The producing centre includes Avola and Noto, the cities with the highest number of enterprises and the largest farming territory. The principal cultivations are the lemon tree (like the PDO Femminello siracusano) and orange tree (the Novellina, Tarocco, Moro and Valencia types). As LEADER II and LEADER PLUS programmes firmly rely on the quality of the products and their organic certification, they have helped some local firms conquer foreign markets by financing their advertising campaigns and their participation to international exhibitions. The fruit sector is mainly constituted of almond production. The principal types are Pizzuta d’Avola, Fascionello and Romana. In spite of its diffusion and the imminent PGI designation to the Pizzuta d’Avola, the almond cultivation chain has never raised constant interest in the District. Only some local factories process the product by simply shelling, peeling and weighing it. Any further working process is carried out outside the District. A group of Avola’s entrepreneurs have recently promoted the establishment of a producers’ association to protect Pizzuta d’Avola and Fascionello types. The numerous organoleptic and healthy properties of the product together with its particular pointed shape (pizzuta) and its fine taste combine to make it particularly suitable for confetti production and more generally for the confectionery industry, and also competitive against new producers in the market, in spite of the hard frosts that have damaged and decreased crops. The presence of so many almond groves in the territory, especially along the roadsides, gives the area a magnificent natural view and high environmental importance. In recent years, the olive sector has given the District a lot of satisfaction and prestige. In fact, olive tree is one of the most representative plants of the area, especially the one from Noto, and you can see long lines of it as you go across the District. The principal types grown in the area are Moresca, Tonda Iblea followed by the Biancolilla, Nocera Etnea and Siracusana varieties. There are very few specialized olive groves. As a matter of fact, olive trees are cultivated together with almond and carob trees. Thanks to the particular land and weather conditions, olives can be harvested early, from September to October. In the territory there are 8 olive mills, though olive oil is mainly sold by measure. Thanks to the interest shown by Noto’s SOAT (Operating Technical Assistance Department) N. 31, the product received PDO status “Monti Iblei” by the GUCE (Official Journal of European Community) L. 322/97 of 25th November 1997 and, in the latest 3 years, it has been awarded Gran Menzione and recognition at national level. Some of the producers belong to Eloro district and one of them was supported by Leader II Programme in their marketing campaign . In the District, the “DOP Monti Iblei” extra virgin olive oil is also produced from Tonda Iblea variety olives and Moresca olives. The cereal sector is mainly based on the durum wheat cultivation both on the coastline and in the inland hilly areas. Straw is widely used for zootechnical purposes. Zootechnics is practised in hilly areas, usually with cereal cultivation. The species bred there are mainly cattle, sheep and goats. The breeding techniques rely on the rich pasture in inland areas where cattle, in particular, are left in a semi-wild state during the day. Pig farming is not so spread and firms are mainly concentrated in Noto and Rosolini territories. Sheep and goat farming develops in the southern area of the territory. Poultry farming counts as many as 160,000 heads, assembled in Rosolini territory. Finally, as far as horse farming is concerned, it is quite limited; horses are only bred by lovers or in some tourist farmhouses. All the District’s villages belong to the Sicilian Pecorino cheese production Area (PDO cheese – G UCE L. 148/96 of 21st June 1996) while Noto’s and Rosolini’s villages belong to the Ragusano cheese production Area (PDO cheese – GUCE L. 163/96 of 2nd July 1996). The fishing sector mainly refers to Portopalo di Capo Passero’s fleet, made up of around 150 crafts, which represents the second major Sicily’s marine, after Mazara del Vallo’s for fresh catch. Fresh catch fish is sold at the local fish market. Fishermen seriously complain about the fact that the harbor risks being covered with sand and they set forth the necessary renewal of the fleet. Finally, fish tourism is one of the few innovative initiatives probably because they need support to market and promote the product. In the District, it is also possible to find breeding activities of both sea and freshwater fish. In particular, Pachino has a huge structure with big ground tanks for fry breeding (dentexes, gilthead, sea basses and other excellent species) and big floating cages where the species are let grow. Some enterprises, particularly in Marzamemi (Pachino), have set up fish factories for the production of typically Mediterranean food (bottarga, tunnina, musciame).